Designing Libraries - Notts inspires! Ruddington, Mansfield Woodhouse and Ravenshead libraries have been refurbished by Nottinghamshire’s Inspire: Culture, Learning and Libraries. The refurbishments are part of a rolling programme of extensive upgrades across the county, working with Demco Interiors on the modernisation of the library interiors. The brief was to create a light and airy feel with new breakout areas, shelving, improved facilities, some new stock and revised layouts for work, rest and play. The brief also highlighted the need to keep the projects within tight budget guidelines and, where possible, recycle shelving. 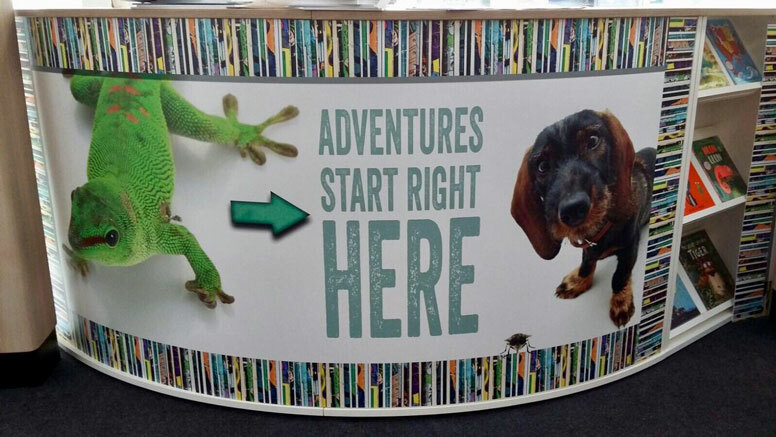 Nottinghamshire Inspire has created a specific look and feel for their smaller libraries which uses common colours and finishes throughout. Demco’s white Cantilibra shelving creates a clean, modern aesthetic, and bright white cladding was added to existing bays to mix and match new and old. “It’s all about the curve in the children’s libraries,” says Rob Stone, Project Sales Manager for Demco, “with white junior shelving, built in seating and ‘cool’ furnishings.” Impulse borrowing display units are eye-catching and end of bay panels include brightly coloured display shelving. The ultra-modern look of the sleek shelving throughout is counterbalanced with innovative graphics, creating an exciting, unexpected twist to the design.